With less than two weeks until STS-130’s launch with Endeavour, managers are already setting up the readiness meetings for STS-131 – which is scheduled to launch the following month with Discovery. With Flight Readiness Reviews (FRRs) overlapping the missions, engineers and managers will be working at full pace for several weeks. Managers are over half way through their major review of STS-130’s status, following the completion of the SSP (Space Shuttle Program) FRR – which took only took one day to review at the Johnson Space Center (JSC), ahead of Wednesday’s Agency Level I FRR that will set the launch date. “Very clean FRR. There were three exceptions identified for open paper but none are expected to be an issue. All orgs polled go and there were no dissenting opinions,” noted FRR notes via L2 – which contains 32 STS-130 SSP FRR presentations, available to download. With fine work on the dual solution approach for the Node 3 NH3 (Ammonia) lines now supporting the launch date, Endeavour is on track for three attempts, with the first on February 7. However, the subsequent standdown for the Atlas V launch is pending the United Launch Alliance (ULA) setting their target date – with rumors of a RD-171 engine failure in Russia placing doubt on the scheduled launch, due to commonality with Atlas V’s RD-180 engine. Endeavour herself isn’t suffering from any major issues on Pad 39A, with the milestone Terminal Count Demonstration Test (TCDT) completed, along with work to install the payload into the cargo bay. “Orbiter: OV-105 / ET-134 / SRB BI-141 / RSRM 109 (Pad-A): The team continues to work toward the targeted launch date of February 7th. 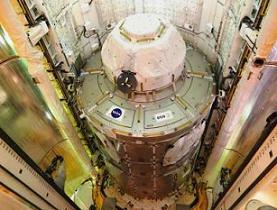 The Terminal Count Demonstration Test (S0017) was successfully completed,” noted processing information on L2. Also completed in the recent pad flow was the payload Interface Verification Test (IVT) (S0600), IMU (Inertial Measurement Unit) calibration, Aft closeouts (continuing), and LOX storage tank sampling. Most of the weekend work was related to payload closeouts and Payload Bay (PLB) door closure for flight. Work on completing Endeavour’s modifications relating to the addition of sensors to record data on the Main Engine Ignition (MEI) Acoustic and SSME (Space Shuttle Main Engine) Ignition Overpressure (IOP) Environments is also on track. “The OV-105 (Endeavour) NASA Vehicle Manager reports that off-line processing for the main engine ignition acoustic sensor modification on the left hand OMS pod stinger doors is nearing completion,” noted the NASA Test Director. As per usual with Flight Readiness Reviews, a couple of previously unknown items of interest for the mission were noted, the first of which related to logistical transfers that will be carried out during STS-130. An additional element of flight rationale was also noted via documentation related to a 20 year old paperwork issue associated some small bolts that have a history with Endeavour’s OMS (Orbital Maneuvering System) Pod. 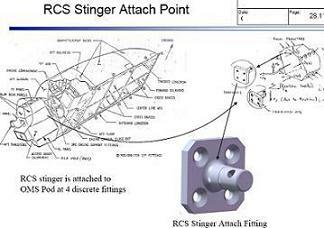 “A recent issue being worked involves bolts used in the OMS engine area to secure small clamps and secondary structures,” noted FRR and Program Control Requirement Board (PRCB) notes. “This is a non-traceable part that can be made by many manufacturers. “Roughly 20 years ago, a Government-Industry Data Exchange Program (GIDEP) was put out against Lawrence Engineering for producing substandard/non-certified bolts. All of these were thought to have been purged, but some have been discovered at WSTF (White Sands Test Facility) – and at least one was used on the OMS engines for OV-105 (Endeavour). Discovery is set to launch just a month after Endeavour returns from STS-130, setting a challenge for engineers and managers alike. At present, the bulk of the departmental FRRs for STS-131 are due to take place next week, prior to the launch of STS-130. Such is the tight schedule between STS-130 and STS-131, even the SSP Level II and Agency Level I FRRs may actually overlap – as opposed to the usual week of separation. SSP managers are more than capable when it comes to two launches in close proximity, as was seen with the STS-125 and STS-127 launch dates – when Atlantis launched to service Hubble, ahead of Endeavour being stood down from supporting LON-400 (Launch On Need) requirements and launched on her ISS mission the following month. STS-131 is slightly different, as Discovery won’t be on the pad – which would be impossible with only one shuttle pad now remaining – by the time Endeavour launches on STS-130, although the schedule is on track to support the March 18 launch date. The next milestone for this mission will be in the Vehicle Assembly Building (VAB) where mating of STS-131’s External Tank (ET-135) with the twin Solid Rocket Boosters (SRBs) will take place this week – although it has been moved down by one day to Tuesday. “SRB stacking continues. The left-forward unit is in work. ET-135 processing continues with ET mate January 26,” noted processing information, as processing with Discovery herself is working no major issues. “In the OPF (Orbiter Processing Facility), the APU (Auxiliary Power Unit) catch-bottle hand valve R&R is complete. (This is a time and cycle requirement). The Payload Bay is now open. “WLE (Wing Leading Edge) micro-TAL installation and checkout continue. 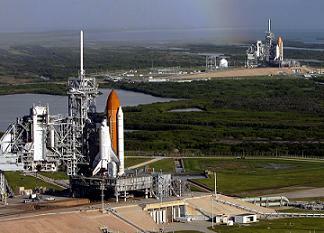 The pace doesn’t let up after STS-131, with Atlantis due back in action on May 14 with the launch of STS-132. Atlantis is on track with her processing milestones, while the mission’s External Tank (ET-136) is tracking a February 24 delivery date from the Michoud Assembly Facility (MAF) in New Orleans.